and they are famous throughout the Burnley & Pendle area. Our pie variety and prices are shown below. For special occasions we also produce small beef patties and pork patties as well as medium and large pork pies. 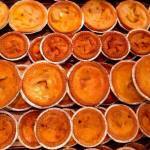 We also make 6 portion trays of meat and potato pie with a pastry crust. We require a few days’ notice for special requests.